WIP - please discard this PR for now. Thank you for this PR. There are a few places where I don't understand why your change bring any value. Could you write some notes to help me understand? Could you also explain this? Ah, I was pretty sure that such a question would be raised. 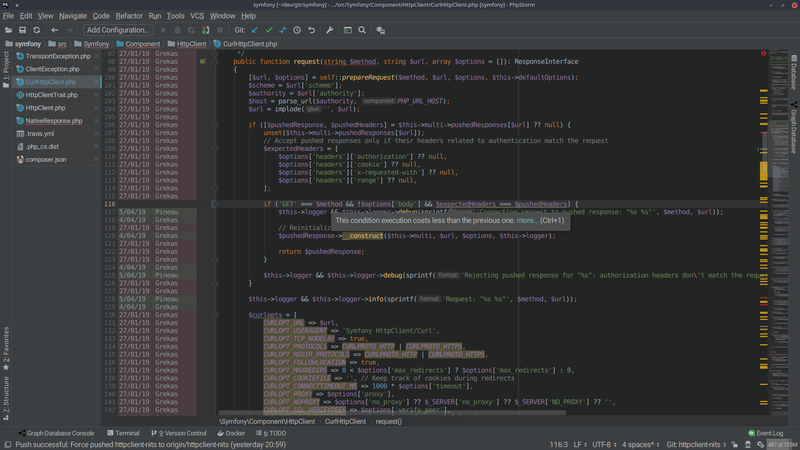 I'm using PHPStorm and an amazing plugin: PHP EA Extended, please, test it, I'm pretty sure you'll love it. It gives you plenty of tips on how to improve the code you're writing. In this exemple, it tells you that the condition could be optimized if we change the order of the conditions. Apparently, the fastest if should be first (less OPCODE) to gain in performance. See the attached screenshot of the plugin on the original code. Thanks for the comments, I will continue to reply asap. I will push the fixes as well. No objections: even if some changes are CS changes mostly, some are real fixes, good catch. Note that this would have mostly been rejected on already released code as changing code style makes merging branches more difficult for mergers. I made a comment where I think the code should change. I think there are some value in this PR. But at some places the change is just a matter of taste. I let other s decide for those instances. Im happy with these changes. [HttpClient] Add tests - update code style nits. This PR was squashed before being merged into the 4.3-dev branch (closes #31018). e77108d [HttpClient] Add tests - update code style nits.